The past few weeks have seen major attempts by the news industry to find creative ways to survive in a digital age, particularly when it comes to advertising, which has been upended by the rise of technology giants like Facebook and Google. In April, Vox Media announced it would open up Chorus, its content management system, to advertisers. It was reported last week that Politico is building Politico Focus, a department devoted to working with advertisers to develop content. And Vox Media just acquired technology news site Re/code, whose successful conference business offers a potential source of revenue beyond advertising. In this uncertain environment, Facebook’s debut of Instant Articles caught the industry’s attention for its offer of revenue potential, faster load times and other upsides for publishers in exchange for allowing Facebook to host their content. As publishers contemplate the risks and rewards presented by Instant Articles, a hard look at the digital publishing business shows the degree to which Facebook, more than any other single company, is where the digital display ad money is, especially when it comes to mobile. While the social media company grows its share of the market, the U.S. news industry continues to struggle in its quest for digital revenue. Facebook is the revenue leader in display advertising, the area of digital advertising from which news organizations make most of their online revenue and where the social networking giant gets nearly all of its revenue. Display advertising – a format that includes banners and video ads – brought in $5.3 billion for Facebook in 2014, eMarketer estimates. That amounts to almost a quarter of the total U.S. display ad market ($22.2 billion) and represents even stronger year-over-year growth than in 2013. 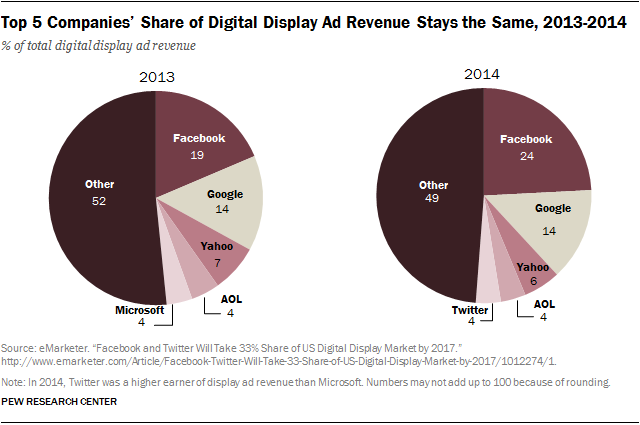 Roughly another quarter of display ad revenue is divided among four more tech companies: Google, Yahoo, AOL and Twitter. That leaves news publishers to compete for the remaining half with all other Web properties who want pieces of the pie. Facebook’s News Feed – where Instant Articles appear – is central to the company’s revenue growth. In its most recent annual report, the company credits an increase in revenue from News Feed ads on both mobile devices and personal computers as the most important factor driving a 65% growth in ad revenue. Meanwhile, despite the 18% increase in digital ad revenue across all media in 2014 to $50.7 billion, news organizations continue to struggle to make inroads. 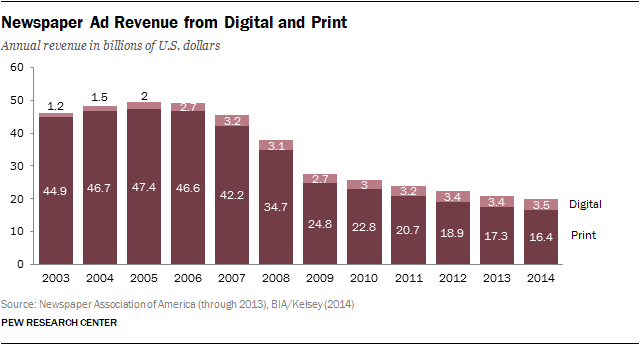 Of all U.S. advertising revenue, 28% comes from digital ads. For most legacy news sectors, digital ad revenue represents a much smaller fraction of their total intake, despite years of experimentation. Just 4% of local TV advertising revenue comes from digital, according to estimates from market research firm BIA/Kelsey, and this is not projected to grow much over the next five years. Newspapers see about 18% of their total ad revenue from digital, according to BIA/Kelsey, and this does not at present make up for falling print revenue. Even for digital-native news organizations, high levels of digital revenue are no guarantee of profitability. Much success in digital advertising – though not all – comes down to the scale of the user base, which allows ads to reach more individuals and more information to be collected for ad targeting. 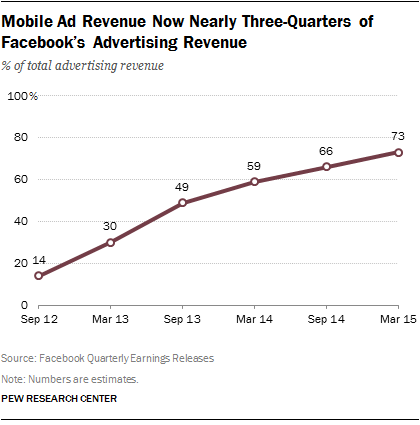 Facebook’s scale gives it the leverage to exert control over the display ad market, especially in the mobile sector. In a time when mobile devices drive digital news traffic, Facebook’s 1.25 billion active monthly mobile users, its dominance in mobile display and its technological prowess hold a good deal of command.